It’s been a couple of months at least since I’ve been to a Clandestine Cake Club event. I’ve been working full time and I haven’t baked much recently. 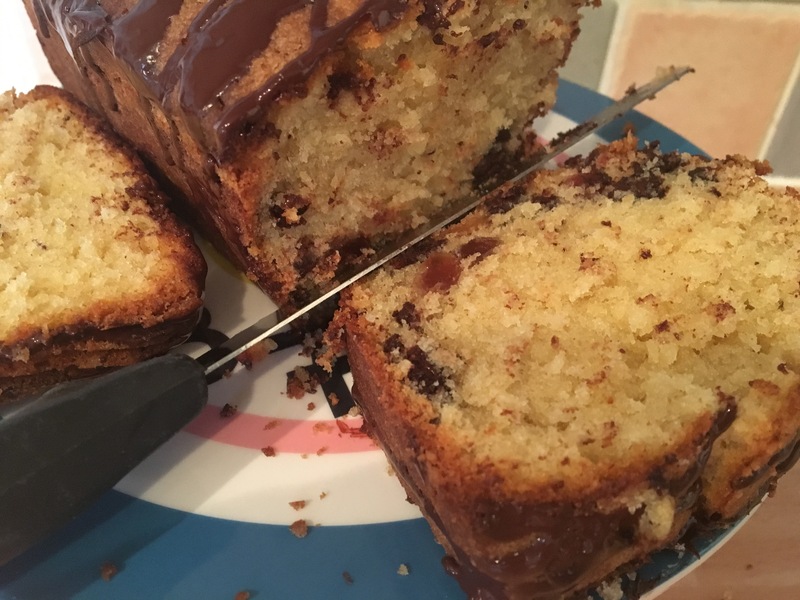 The Clandestine Cake Club’s VCake Events are a fantastic idea if you can’t get to an event but you still want to bake. I love taking part in them and I baked a cake. But unfortunately, I forgot to email my cake photos to the Club’s founder, Lynn Hill so my cake wasn’t included in the event write up. The idea was that many people collect or stash recipes gleaned from magazines, leaflets and booklets. I do. I buy Good Food magazine and Delicious magazine but only get chance to cook recipes out of them sometimes. I’m always picking up recipe leaflets and booklets but never seem to get round to cooking anything from them. This event was such a good idea to get you searching through those cake recipes you wish you had had chance to bake. 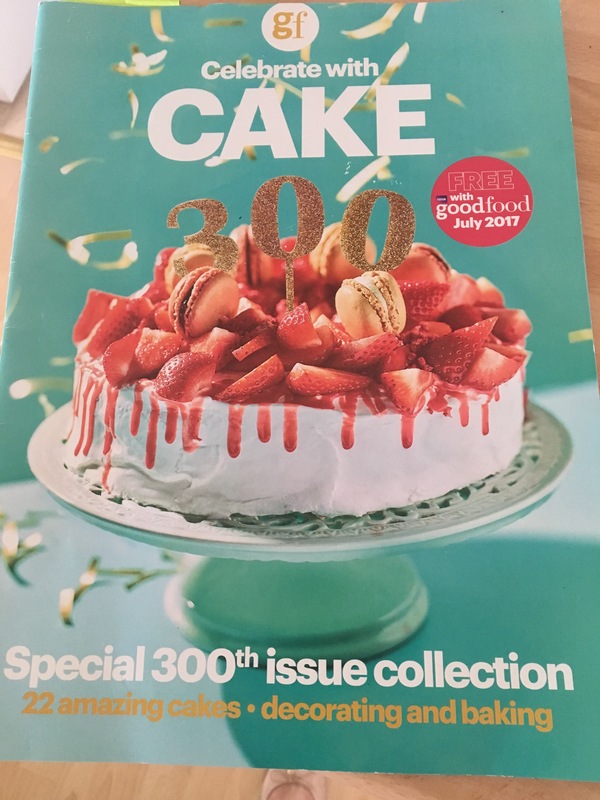 Funnily enough this month’s Good Food magazine came with a free cake recipe booklet to celebrate the magazine’s 300th issue! I’ve not been buying all of those, I was only 18 when the first issue of Good Food mag came out and as a sixth former cooking was the last thing I was interested in! 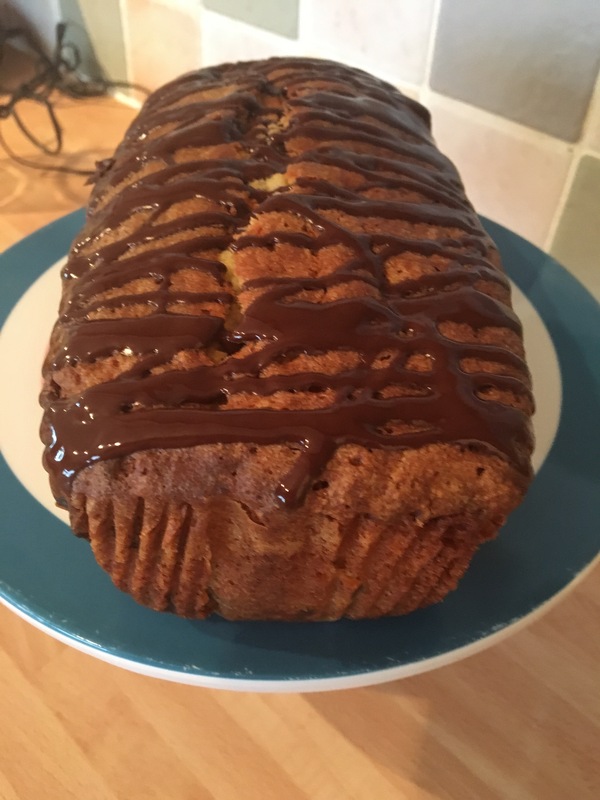 There were several recipes I wanted to try in the booklet but the one that I thought my whole family would eat was the Chocolate Cherry Bakewell Loaf. 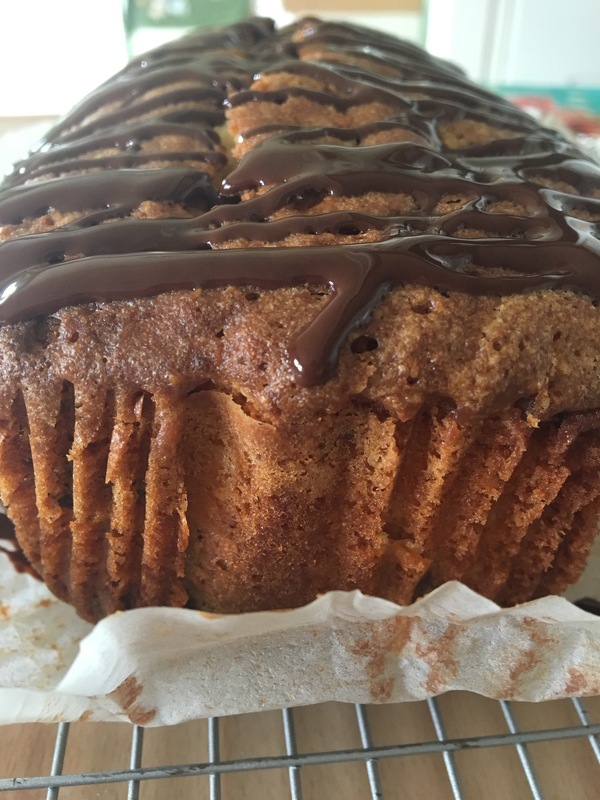 All the flavours of a bakewell tart but in a loaf form and with chocolate as well. Bound to be a hit! 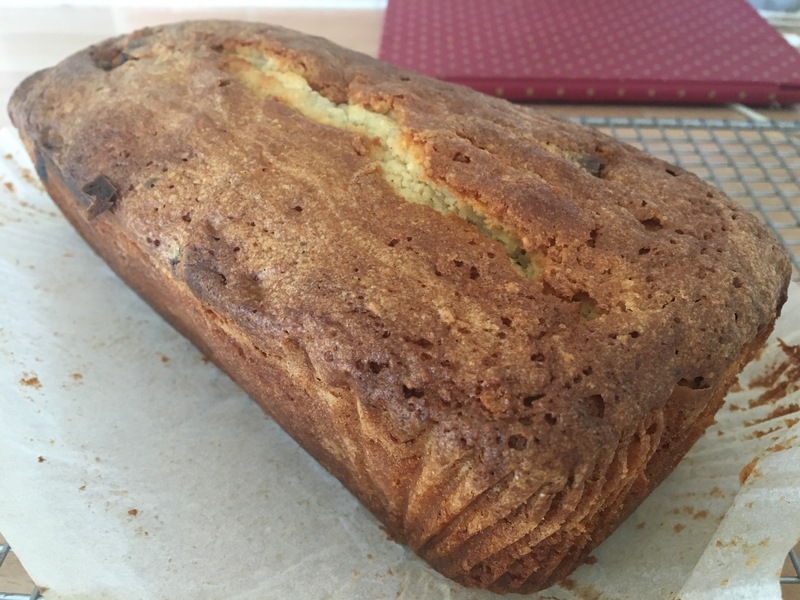 Last Sunday I chose to bake this, along with some scones. Mr SmartCookieSam was out at a Classic Car show and my two grown up children were at work. So it was me on my lonesome! Perfect opportunity to get my apron on and the scales out, especially as the weather has been so rubbish. Recipe as featured in Good Food Magazine. 200g dark or milk chocolate, chopped. 2 tbsp toasted, flaked almonds. First, heat the oven to 160oC/ 140oC fan/ Gas Mark 3. 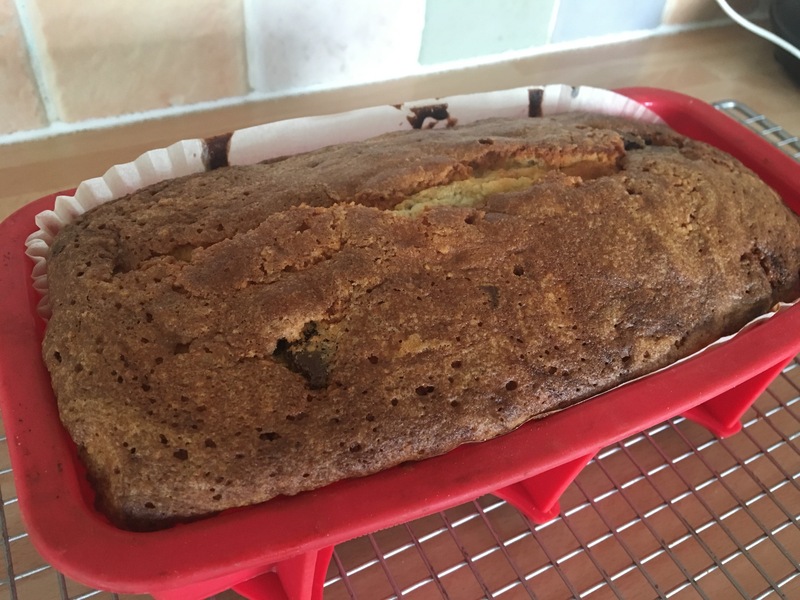 Line a 900g loaf tin with baking parchment. I swear by the ready made loaf tin liners readily available from shops like Lakeland. Now to deal with the cherries. If you are using fresh cherries, you need to wash, destone and half them first. Then toss them in a tablespoonful of the flour from the quantity already weighed out. If you are choosing to use glace cherries like I did, then thoroughly wash them to get the syrup off. Then pat dry on a paper towel, halve them, rinse and dry again. Then toss in a tablespoonful of flour. Cream the butter and sugar together in a large bowl until the mixture becomes light and fluffy. When this is done, add the eggs one by one and mix well between each addition. Fold in the rest of the flour, the baking powder and the ground almonds. Stir in the milk, the two extracts and half of the chocolate. Then add in the cherries. Bake in the oven for 1 hour 10 minutes approx or until an inserted skewer comes out clean. Leave to cool in the tin for 10 minutes and then turn out on to a wire rack to cool down completely. 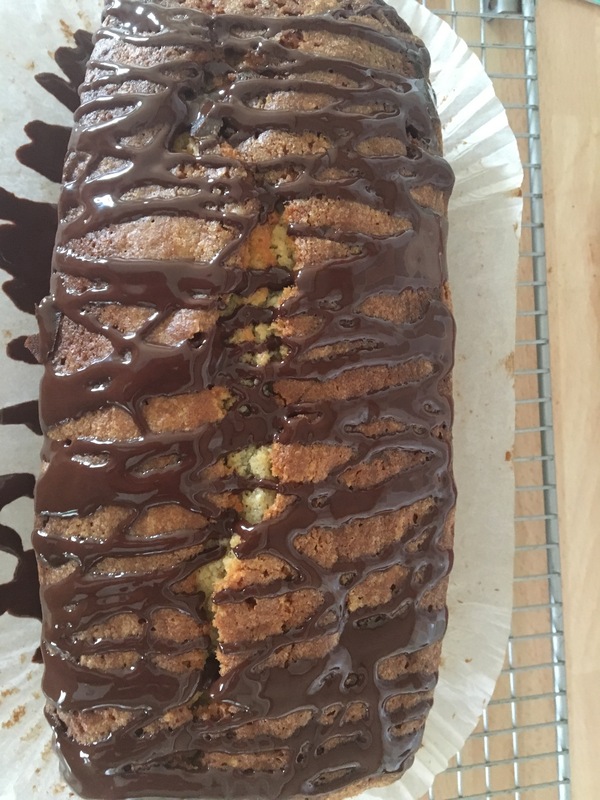 When the cake has cooled down, melt the remaining chocolate in the microwave and drizzle or pipe it on top of the cake. Scatter on top with toasted, flaked almonds. Wait for the chocolate on top to set a bit before slicing the cake. 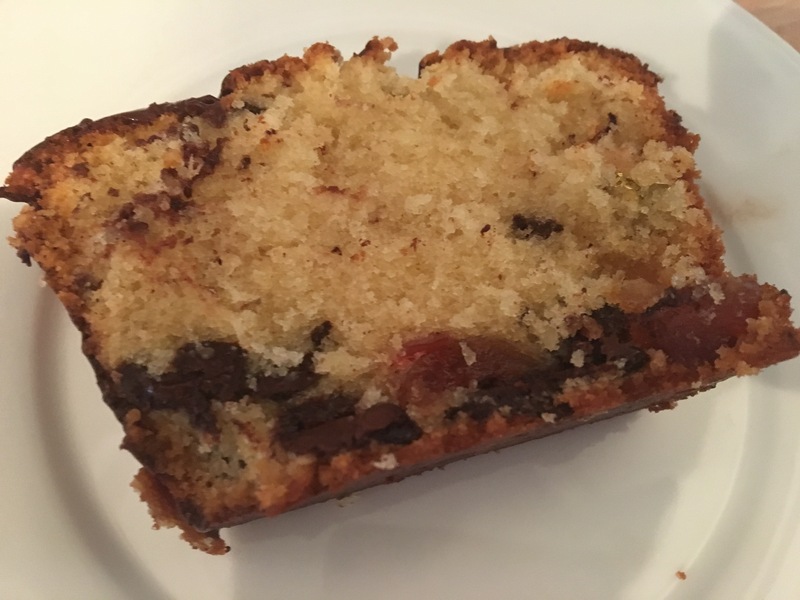 Now as I’m always doing things in a hurry or have a zillion things on the go at once, I was a little bit disappointed to find my chocolate and cherries had sunk to the bottom of the cake. I’ve made cherry cakes before which have remained in the middle. So why not this one? I thoroughly rinsed and dried the cherries as well as tossing them in flour. Maybe it was the rest of the cake mixture. Didn’t spoil the taste of the cake though. I also didn’t bother with adding toasted almond flakes to the top of the cake. I demolished a slice of this gorgeous cake with a cup of tea on that Sunday afternoon while reading a magazine. 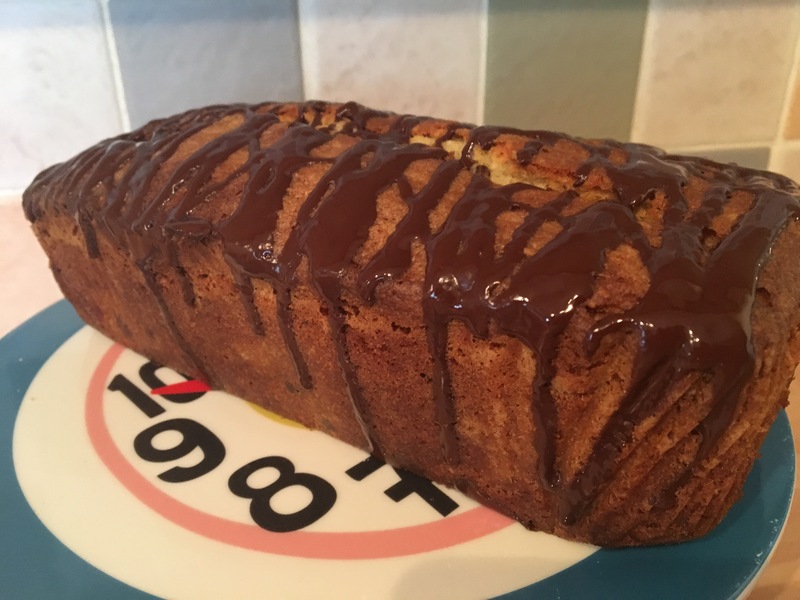 It had the almond flavour running through it and tasted just like a cherry bakewell cake should taste with the added dimension of dark chocolate. Cherries and chocolate work so well together. I will definitely make this cake again as my family really enjoyed it. The remainder froze well, although the cake apparently does keep in a cake tin for up to four days. Previous Post White Chocolate And Raspberry Fridge Cake. Next Post Tiger Cake from The Nordic Bakery.